The Pennsylvania Academy of Fine Arts (PAFA) holds a distinguished place in the art world as the first and oldest art school and museum in the nation. Six of its alumnae with Vineyard and regional associations will exhibit their work at the Louisa Gould Gallery in Vineyard Haven, beginning on Thursday, Aug. 30. A reception takes place on Saturday, Sept. 1, from 5 to 7 pm. The show previews a larger exhibit to be held in September at the Cape Cod Museum of Art in Dennis with 12 PAFA alumni. The six artists in the Louisa Gould show are Debra Hope Colligan, Jeanne Staples, Elizabeth Taft, Sarah Son-Theroux, Saskia Eubanks, and Deena Gu-Laties. 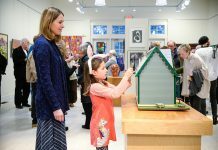 East Falmouth artist Debra Hope Colligan collaborated with Alison Campbell, manager of Government and Foundation Relations at PAFA, to create the show and bring it to the Louisa Gould Gallery, as well as to the Cape Cod Museum. Ms. Gould narrowed the number of artists to six based on their regional connections, the size of her gallery, and a focus on landscape. “I thought it was really important to raise awareness of the Academy and the people who went to the Academy,” Ms. Colligan said in an interview last weekend. While a PAFA student, she was active in the Philadelphia music scene and once brought Bruce Springsteen’s band to one of her art classes. Many years later, she suffered a traumatic brain injury in a horseback riding accident, and the rehabilitation staff thought she was hallucinating when she told them she knew Mr. Springsteen. She has gone on to organize and participate in art events for a number of healing, rehab, and brain injury organizations. 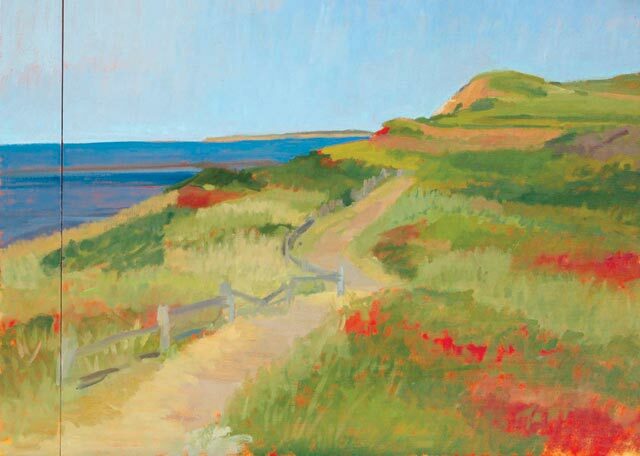 After graduating from the Academy in 1979 and while she was living in Philadelphia, Ms. Colligan spent many years visiting Cape Cod and Martha’s Vineyard to paint outdoors. She moved permanently to East Falmouth in 2008. One of the artist’s five paintings included in the Gould show is called “Jessica Springsteen and Sublime,” and is set at a Devon Horse Show Junior Hall of Fame Classic event where she happened to see the singer’s daughter. Edgartown artist Jeanne Staples completed her studies in the classical art program at PAFA in 1982, earning a Master’s degree in Art. Five of her dramatically lit landscape paintings are included in the show. “It was a very rigorous, academic artistic experience, a very thorough education in painting and drawing at a time when so many art schools had dismissed that kind of focus,” Ms. Staples said. She was happy to be able to embrace realism at PAFA during an era when abstraction was the fashion and realism wasn’t given much respect. Ms. Staples met Vineyard Haven painter Elizabeth Taft through a PAFA alumni organization. Like Ms. 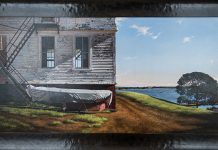 Staples, Ms. Taft paints brightly colored plein air, or outdoor, landscapes set on the Vineyard. She finished her Master of Fine Arts degree at PAFA in 1996 and has three paintings in the show. Twenty students were in her class. “I was the only landscape painter in the group,” Ms. Taft says. “It’s a small school, so it felt really intimate.” She also commented, “Going to graduate school solidifies your commitment to making art.” She liked the Academy’s connection with a museum. When a student finishes a degree, they and their classmates exhibit their work at the PAFA museum in a special show. Somerville resident Saskia Eubanks’s five paintings emphasize dramatic cloud formations and changing elements of natural phenomena. A 2003 graduate of the Academy, she completed the classical fine arts program in painting, drawing, printmaking, and sculpture. “My interest lies in exploring relationships I notice through observation and expressing them in ways that both defy and define the boundaries of representation,” she writes in her artist’s statement. Sarah Son-Theroux, who works plein air on Cape Cod, began painting landscapes during a 1991 class at PAFA with teacher/artist Louis Sloan. Because she didn’t have an easel, she had to prop her palette and painting wherever she could while she worked. “Every time I go out to paint with my easel and brushes is like going out for the first time,” she said. Ms. Son-Theroux is exhibiting five of her Cape Cod landscapes. Shanghai native Deena Gu-Laties trained in China before immigrating to the U.S. and enrolling at PAFA. She completed her degree in 1997. Although she also paints landscapes, she is exhibiting a floral painting, “Orchid,” which incorporates a blend of Eastern and Western influences. Family obligations kept her from including more work. The PAFA show continues through Monday, September 10. 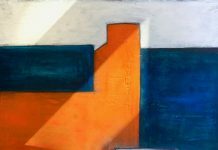 New England Artists of the Pennsylvania Academy of Fine Arts, August 30 through September 10; reception Saturday, Sept. 1, 5 to 7 pm, Louisa Gould Gallery, Vineyard Haven. For more information, call 508-693-7373 or visit louisagould.com.